Some of us find it very difficult to ask others for help. Prayer is our declaration that we need God. But what about when we don’t pray? What does our prayerlessness say about us? None of us who are Christians would say that we don’t need God. So why do we sometimes not pray? Jesus tells his disciples, “When you pray, you must not be like the hypocrites” (v. 5). “‘Hypocrites’ originally referred to Greek actors who wore different masks to play various roles.” A hypocrite is a religious performer. When hypocrites pray, “they love to stand and pray in the synagogues and at the street corners” (v. 5). Why? “That they may be seen by others” (v. 5). Is it a sin to pray in public? No. It’s not wrong to pray and be seen; it’s wrong to pray to be seen. Real prayer is humble. God wants real prayer from us, not a performance. Jesus declares, “Truly, I say to you, they have received their reward” (v. 5). What is their reward? The admiration of people who can’t see the hypocrite’s heart. They are fooled, but God isn’t. Jesus goes on to say, “But when you pray, go into your room and shut the door and pray to your Father who is in secret. And your Father who sees in secret will reward you” (v. 6). The Greek word (tameion) translated “room” usually referred to a “storeroom.” In those days, homes didn’t have multiple bedrooms. Jesus wasn’t saying that we must always pray in private. This is an example of Jesus using hyperbole in his teaching. Hyperbole is obvious exaggeration (e.g., “It is easier for a camel to go through the eye of a needle than for a rich person to enter the kingdom of God,” Matt. 19:24). Jesus uses hyperbole to emphasize to his disciples that we should pray as if no one but God is listening (i.e., not to impress others). What’s important is not the location of the one who prays, but the attitude of the one who prays. The Lord’s Prayer begins with the words “Our Father in heaven” (v. 9), not “My Father in heaven.” “Our” is plural. We use the word “our” when we’re praying with others. God wants his children to pray together. 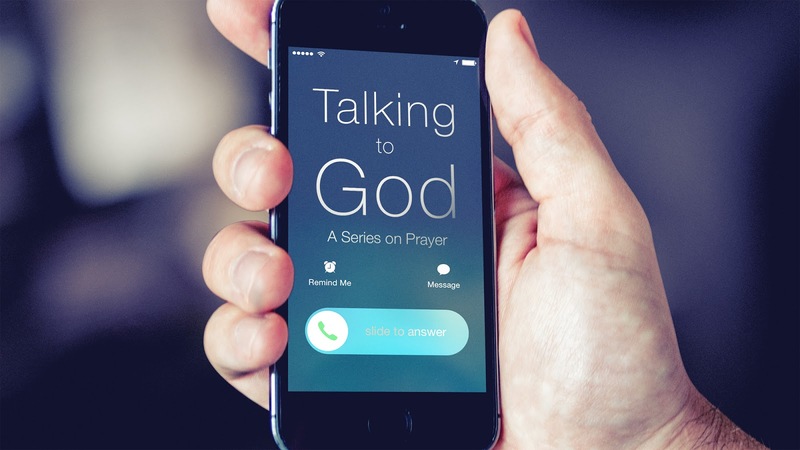 This is what the early church did: “They devoted themselves to…the prayers” (Acts 2:42). Not only do I need God, but we, as a church, need God. When we pray together, it is a church-wide admission that we need God. What can we do of significance without God? Nothing. How Long Until You Hear Me? It’s normal to be frustrated with prayer. In the Bible, you’ll find people asking God the same question: “How long until you’re going to do something about my prayer?” David asked this question in Psalm 13. In the Bible, we find many amazing promises about prayer. For example, “And this is the confidence that we have toward him, that if we ask anything according to his will he hears us. And if we know that he hears us in whatever we ask, we know that we have the requests that we have asked of him” (1 John 5:14-15). When we read this and other biblical promises about prayer, we can become frustrated because our experience with prayer is often very different. We ask, and we don’t receive. Let me be clear: I don’t have all of the answers about unanswered prayer. More often, I feel like David in Psalm 13 than the apostle John in 1 John 5:14-15. But the Bible does give us several truths about prayer that can help us when we’re struggling with unanswered prayer. We must remember these truths when we pray. 1. When we pray, we must remember that we are talking to a loving Father. The Lord’s Prayer begins by addressing God as “Our Father in heaven” (Matt. 6:9). Throughout 1 John, John emphasizes that believers are God’s children. In 3:1, he writes, “See what kind of love the Father has given to us, that we should be called children of God.” God is a Father who loves his children more than we can imagine. Because we know God loves us, we can have “confidence” (1 John 5:14) when we pray. But remember, sometimes a good father has to say “no.” And God’s “no” is always a good thing. 2. When we pray, we must remember that unrepentant sin can prevent our prayers from being answered. Psalm 66:18 says, “If I had cherished iniquity in my heard, the Lord would not have listened.” This doesn’t mean that God will only listen to sinless people. God won’t listen to those who cherish (i.e., treasure) sin. The apostle Peter writes that husbands can cause their prayers to be hindered: “Husbands, live with your wives in an understanding way, showing honor to the woman as the weaker vessel, since they are heirs with you of the grace of life, so that your prayers may not be hindered” (1 Peter 3:7). 3. When we pray, we must remember that prayer isn’t all about us. Prayer is about getting God’s will done, not ours (“if we ask anything according to his will,” 1 John 5:14). The first three requests of the Lord’s Prayer are requests for God’s name to be hallowed, God’s kingdom to come, and God’s will to be done (Matt. 6:9-10). God will ignore selfish requests: “You ask and do not receive, because you ask wrongly, to spend it on your passions” (James 4:3). So we can’t receive anything we ask for in prayer. 4. When we pray, we must remember that sometimes we have to wait for our prayer to be answered. Sometimes God says “wait.” It’s hard to wait. It could be said that when God says “wait,” he’s saying “yes” (like when a father says, “Yes, we can go to park tomorrow”) without us realizing it. 5. When we pray, we must remember that prayer really does work. Sometimes God says “yes.” It’s possible that when we pray we can “have the requests that we asked of [God]” (v. 15). Of course, this doesn’t mean that we can make God do things he doesn’t want to do. But it does mean that God can choose to do his will by answering “yes” to our prayers. When I was in high school, I went with my church’s youth group to Mount Katahdin in Maine. The highlight of the mountain hike was a section at the top of the mountain called Knife Edge. If you fall off either side of Knife Edge, you could die. “And lead us not into temptation, but deliver us from evil” (Matt. 6:13). A few years ago, I was pressure washing my deck, and I became curious about how strong the water pressure was. So I sprayed my foot—my bare foot. That was a mistake. My foot hurt so much that I was afraid to look at it, thinking there might be a hole in it. I discovered the hard way why it’s recommended that you wear protective footwear while pressure washing. The final petition of the Lord’s Prayer is a petition for protection: “And lead us not into temptation, but deliver us from evil” (Matt. 6:13). As people often foolishly do a job without wearing the recommended protective gear, we often foolishly go through a day without praying to God for protection from sin. Why do we do that? It’s often because of overconfidence in ourselves. But if trials produce steadfastness, should we pray to avoid them? Jesus did. He prayed, “My Father, if it be possible, let this cup pass from me; nevertheless, not as I will, but as you will” (Matt. 26:39). We can pray to avoid a trial, but we must allow for the possibility that it could be God’s will for us to go through the trial. If so, we must pray for protection, knowing that the temptation to sin is greater during times of trial. On the same night that Jesus prayed, “Let this cup pass from me,” Peter boasted that he would always remain faithful to Jesus, no matter the cost. Jesus said to him, “Before the rooster crows, you will deny me three times” (v. 34). But Peter replied, “Even if I must die, I will not deny you!” (v. 35). Later, Jesus urged Peter, “Watch and pray that you may not enter into temptation. The spirit indeed is willing, but the flesh is weak” (Matt. 26:41). Peter was indeed willing to be loyal to Jesus, but he didn’t realize how weak his flesh really was. Instead of praying, Peter fell asleep. After Jesus was arrested, Peter’s faithfulness to Jesus was tested. Peter was asked three times if he was a follower of Jesus. Three times he denied it. The rooster crowed, and Peter “wept bitterly” (v. 75). To avoid succumbing to temptation, we must acknowledge our spiritual weakness and pray to God for help. The Christian life is like a never-ending battle. “Be strong in the Lord and in the strength of his might. Put on the whole armor of God, that you may be able to stand against the schemes of the devil” (Eph. 6:11). “[Our] adversary the devil prowls around like a roaring lion, seeking someone to devour” (1 Peter 5:8). The Greek word for “evil” (poneros) could also be translated as “the evil one” (i.e., the devil). The devil and his temptations can be resisted: “Resist him, firm in your faith, knowing that the same kinds of suffering are being experienced by your brotherhood throughout the world” (1 Peter 5:9). “No temptation [peirasmos] has overtaken you that is not common to man. God is faithful, and he will not let you be tempted beyond your ability, but with the temptation he will also provide the way of escape, that you may be able to endure it” (1 Cor. 10:13). How do we resist the devil? Through prayer and God’s word: “Take…the sword of the Spirit, which is the word of God, praying at all times in the Spirit” (Eph. 6:17-18). When Jesus was tempted by the devil, he used Scripture to resist the devil (Matt. 4:4, 7, 10). Before Peter urges his readers to resist the devil, he tells them, “[Cast] all your anxieties on [God], because he cares for you” (1 Peter 5:7). When trials come into our lives, it doesn’t mean that God doesn’t love us. The cross proves that he cares about us. Don’t turn your back on the one who cares for you. “Jesus was led up by the Spirit into the wilderness to be tempted by the devil” (Matt. 4:1). It was the devil who did the tempting, not God. But it is true that the Spirit led Jesus into a trial (fasting for forty days in the wilderness) that was used by the devil to tempt Jesus. (The first temptation was “Command these stones to become loaves of bread,” v. 3). The trial tested the faithfulness of Jesus to the Father. “God tested Abraham” (Gen. 22:1). We want our children to learn how to be self-dependent. We don’t want them phoning home when they’re 30, asking how to boil water. Self-dependence (to a certain degree) is a good thing, but we can never become totally self-dependent. In reality, we are all God-dependent. You might think you’re being self-dependent by growing your own food, but were did the seeds come from? Who caused the sun to shine and the rain to fall? The fourth petition of the Lord’s Prayer is “Give us this day our daily bread.” When we ask God to give us our daily bread, we are acknowledging our dependence on him. Most people wish they were rich, but being rich isn’t always a good thing. “Those who desire to be rich fall into temptation, into a snare, into many senseless and harmful desires that plunge people into ruin and destruction. For the love of money is a root of all kinds of evils” (1 Tim. 6:10). A large percentage of people who win the lottery end up miserable (e.g., divorce, bankruptcy, murder). “Give me neither poverty nor riches; feed me with the food that is needful for me, lest I be full and deny you and say, ‘Who is the LORD?’ or lest I be poor and steal and profane the name of my God” (Prov. 30:8-9). “If we have food and clothing, with these we will be content” (1 Tim. 6:8). If we are depending on God to meet our needs, we shouldn’t be anxious. “Do not be anxious about tomorrow” (Matt. 6:34). Instead of being anxious, we are to trust God to meet our needs one day at a time. “Give us this day our daily bread.” When God delivered the Israelites, he gave them daily bread. They were only to collect enough manna for one day. God was teaching them to depend on him. But they didn’t learn the lesson. When it was time for them to enter the Promised Land they lacked faith in God. And they wandered in the wilderness for 40 years. Jesus fasted for 40 days in the wilderness. Then Satan came to him and said, “If you are the Son of God, command these stones to become loaves of bread” (Matt. 4:3). Jesus refused. While on earth, he lived as you and I are to live: trusting the Father. Jesus said to Satan, “Man shall not live by bread alone, but by every word that comes from the mouth of God” (Matt. 4:4). We are to value God’s word more than bread. “Seek first the kingdom of God and his righteousness, and all these things [the things mentioned in verse 25] will be added to you” (Matt.6:33). We can depend on God because he’s our Father in heaven (see Matt. 7:7-11). He “did not spare his own Son but gave him up for us all” (Rom. 8:32). Someone who loves us that much can be trusted.